We've taken our knowledge on rate control, added our unique style and threw in a bunch of user ideas to create a completely customized and powerful room rate system. No other web-based guest management and online booking application makes it so easy to setup and manage the nuances of room rates. We've skipped past the traditional approach to room rates and instead implemented a more intuitive graphical interface. First, a default nightly rate is set and assigned a color code. 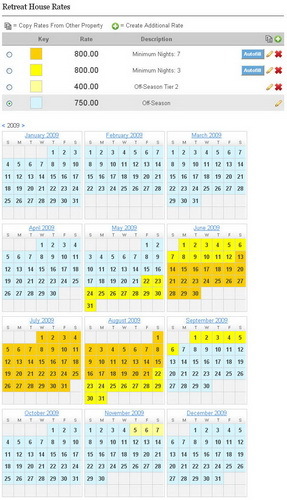 Then, other color codes are associated with the nightly rates for all of your various seasons. Once all the rate bands are setup, it's just a matter of choosing a color and assigning it to the calendar. So, technically each room or property in your system could have a different rate for everyday of the year...now that's powerful. Property owners and managers need the flexibility to change rates and rules as the seasons and situations dictate. The InnFirst.com application makes it super easy to setup room rates that vary whether a guest books a night, a week or two months or more. Additionally, some properties charge by how many guests are in the room, some charge for children, some do not charge for children. Some property owners prorate across seasonal rate bands, some apply the higher rate bad, some the lower. The point is, we are all different and the InnFirst.com application makes it easy to be different!